It is hard to believe that Diascia are relatively new to the gardening world. This colourful group of plants from South Africa, includes two species that have been used widely to give us the wonderful hybrids we see today. The flowers may be small, however they appear in masses. So lets explore the wonderful world of Diascias. This is a group of plants that varies in height, from around 15 cm to 30 cm, the Genta series will reach 30 40 cm in height. Some of the species will reach nearly 1 metre in height. Flower colour also varies, from white through to pinks, apricot, red and blue. All produce lots of flowers, and all are easy to grow, lots to like about Diascia. They look good in rock gardens, in the border or even in containers. Sometimes called ‘Twinspur’ referring to the spurs at the back of the flowers, some with apricot tinged with blue to rose colored. Diascia cordata is the most commonly found species, and new dwarf or low growing varieties are also being released. They are long flowering and will perform from mid spring right through to autumn in the right conditions. 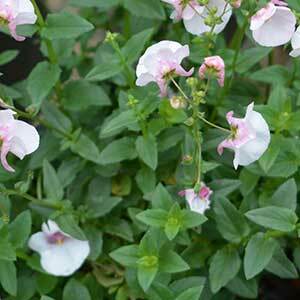 The smaller types are well suited to growing in hanging baskets and containers. A sunny position in a well drained soil is the key to all varieties. Diascia are suitable for growing in a rock garden and are a good ground cover, preferring full sun to part shade. Many varieties also grow well in hanging baskets. These are a plant that do not do well over cold winters, especially in wet soils, so treat them as an annual if that is your climate zone. Like many perennials they can be pruned lightly, or dead headed after flowering to promote a second flush of flowers. In the garden, fertilise twice a year, early spring and again in early summer. In containers, use a liquid fertiliser every month from spring through summer. Deadhead as soon as spent flowers appear. Older plants can be pruned back hard to reinvigorate. Mulch around the plants to maintain a cool root run and help control weeds. Propagate from cuttings, or simply by division of established clumps. Diascia barberae. – A low growing species to around 30cm in height, pink foxglove like flowers. Diascia integerrima – One of the hardier species, reaching around 30 cm in height and good pink flowers. A few named low growing cultivars are available. Diascia personata. – This is a taller growing species that will reach 1m in height with dusky pink flowers, hardier in cool climates than others..
Cultivars include Diascia ‘Darla’ Light Pink.